Other than looking kinda funny with a giant tube sticking out of your mouth, snorkeling's some of the most fun you can have in/on the water that doesn't involve a giant motor and case of beer. It’s essentially scuba diving, but without the $500 certification course and threat of an embolism! And what's even better about snorkeling, in addition to it being relatively cheap and requiring only basic swimming skills, is that you get to spy some pretty spectacular underwater scenery and wildlife, without ever straying too far from the boat. 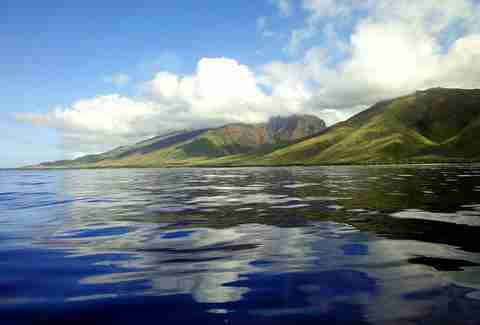 But which snorkeling destinations offer the best views? Here are the 12 spots in the United States (and its territories) that we think take top billing. Yes, when people think of water and Florida, they usually think of the beach (and possibly spring break); but this river in North Central Florida boasts some of the clearest inland water in the nation. 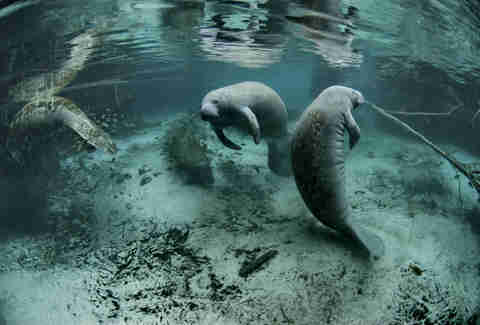 It's also the only place in the country where you can regularly swim with the endangered West Indian manatee. If you're nice, one might even swim up and give you a nuzzle. Sure, you’ll probably need a wetsuit to snorkel around this beach near San Diego, but it's worth it to score a close-up shot of garibaldi, yellowtail, and leopard sharks. 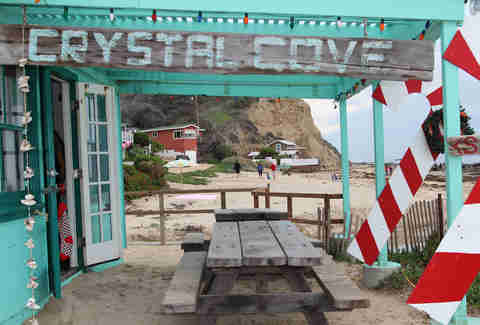 And once you get out of this tucked-away turquoise cove, you can dry off on arguably the most scenic beach in Southern California. Forget the US mainland, this protected marine sanctuary in the US Virgin Islands might very well be the best snorkeling IN THE WORLD. The reef covers over 19,000 acres and surrounds two-thirds of St. Croix, wrapping the island in some of the most diverse marine life you'll encounter in a snorkel mask. The Buck Island underwater trail takes you right past hawksbill sea turtles, manta rays, and colorful fish that all feed off the largest contiguous reef in the Eastern Caribbean. Telling you there’s great snorkeling in Hawaii is kind of like telling you there’s great beer in Portland, but finding the best spots isn't as easy. On Maui, your move is this shallow coral reef on the eastern end of the park. 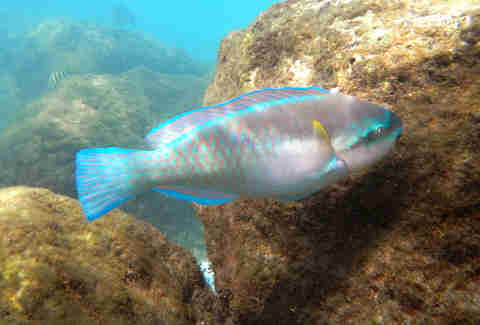 The reef’s proximity to the surface allows snorkelers to see fish they'd normally need a tank and a certification to appreciate, including the really fun to say humuhumunukunukuapua'a -- Hawaii's state fish. Quick: what’s the only county in America with TWO national parks? Raise up, DJ Khaled, it’s none other than DADE COUNTY. 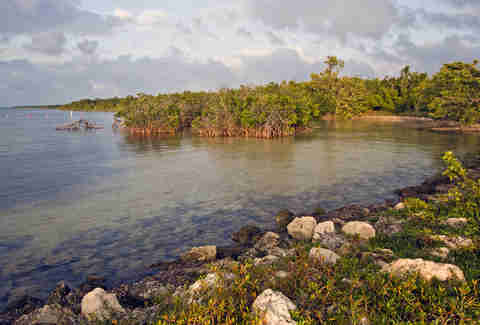 Not only is it home to more people with “Made in Dade” tattoos than you’d care to think about, but it's also home to the Everglades and Biscayne National Parks, the second of which is part of the Florida Keys Reef Tract. Here, you can snorkel over shipwrecks, living reefs, and even spy the occasional dolphin. Though many South Floridians know this inlet in PBC more for its legendary party scene, the area's diverse marine life is far more impressive. 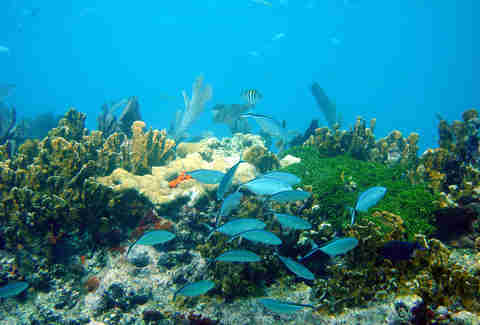 Six man-made reefs sit in the cove, and among the boulders you’ll see parrotfish, barracuda, and bonefish, not to mention manatees if you're snorkeling in the winter. Just don’t go on a holiday weekend, or else you'll see the popular species known to marine biologists as: submerged can of Natty Light. 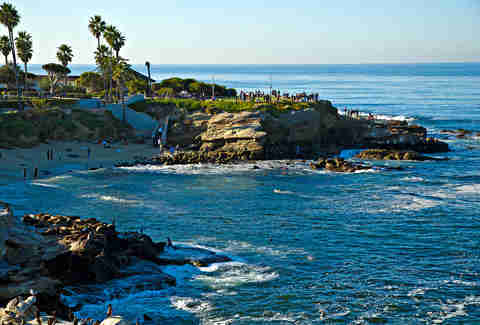 In between the surfer’s paradise that is Newport Beach and the mansions of Laguna Beach sits this state park, once home to the world’s nicest mobile home park but now possibly the best dive site in Southern California. Even for the tankless, a snorkel through the underwater marine park at Pelican Point or Reef Point offers a glimpse of garibaldi, dolphins, and more. Though the Florida panhandle is often more known for tossing mullets than looking at them, this man-made reef 500ft offshore is the best snorkeling in the Redneck Riviera -- just 6-9ft below the surface, you'll find all sorts of marine life. This secluded white sand beach on Culebra Island -- 20 miles northeast of Puerto Rico -- is one of the few untouched beaches left in any US territory. You only need to swim out a few feet here to catch the bright red living coral topped with sea fans, as well as tropical fish that have steered clear of the more popular beaches in the region. 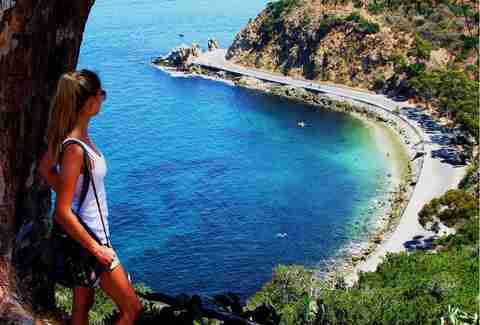 This tiny marine preserve off Avalon Bay in Catalina is the top snorkeling spot on this famous SoCal island. After navigating your way down a treacherous pebble staircase to the water, you'll be swimming with tons of friendly cold-water fish that will come right up to you asking for food. There's also a thick kelp forest and rock reef to explore. In case you missed it, Floridians actually enjoy things other than cockfighting and stealing your identity. And a big reason why is because the state is home to the largest living coral barrier reef in North America, which stretches from Key Biscayne in Miami down to Key West. 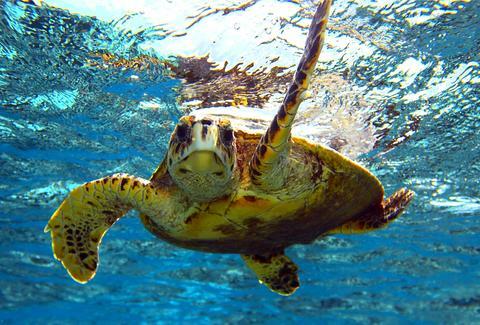 About halfway down, you can stop at this award-winning state park, where a quick swim out will have you hanging with sea turtles, grouper, and all the other tropical fish people travel the world to see. 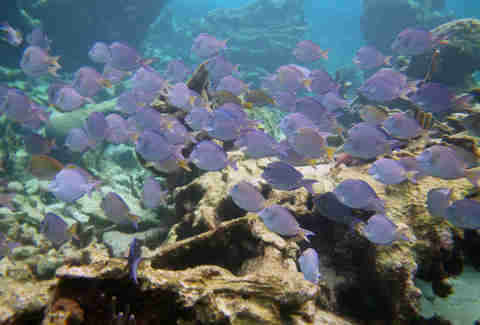 The diving here is also top notch, but even without your PADI card this park is worth a visit. 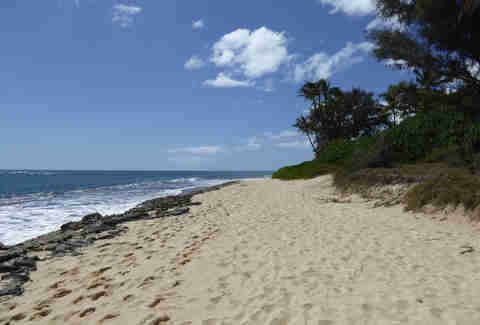 Makaha Beach Park on the western side of Oahu offers locals and tourists alike some of the best snorkeling on Hawaii's most populated island. 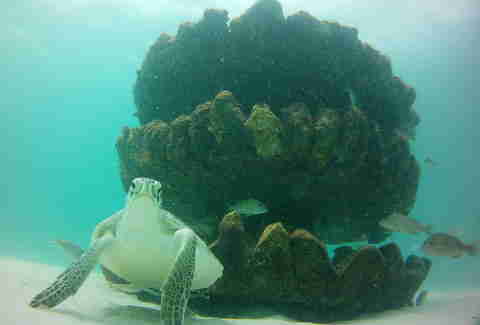 Swim out to the buoys that mark the coral reefs and get ready to hang out with some giant green sea turtles.